The Sled Push is an excellent exercise to include into your training and workouts if you want to build better willpower, test your strength and burn fat. Intense bursts of high activity are a great way to see how far you can push yourself mentally as well as physically. When these are combined and included within longer, slower WODs, then you have a great recipe for burning fat as well as getting much fitter. When it comes to training, mental toughness is generally understood as the ability to endure and succeed, however bad or tired you feel, regardless of how difficult the workout is. It is a form of willpower and the ability to fix a goal and work towards that end result until it is achieved. People often believe that you either have this kind of willpower or you don’t, but that is not always the case. Mental toughness is a skill like any other, and can be taught and developed. These workouts will help you help build that part of your fitness. Workouts that are designed to target mental toughness are, by definition, tough. Often involving exercises such as hill sprints, trail runs, air bikes, burpees, wall balls, or sled pushes, they will drive you beyond your limits and expand your personal confidence of what you are able to do. The XPO Trainer is a unique type of Sled, fitted with wheels and designed with a resistance motor that offers exponentially more resistance the harder you push. This resistance curve enables it to be instantly scaled for any ability level. 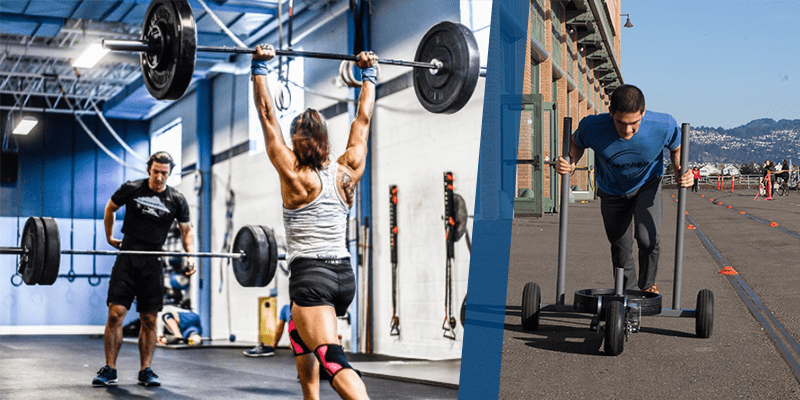 If an elite female Crossfitter and a male newbie both complete a 30 second max effort Sled Push, then the resistance offered by the XPO Trainer will be not be the same, it will be relative to how much force they are able to produce based on their own strength and fitness levels. This makes the XPO Trainer a perfect machine for athletes of all abilities. So before you choose your next workout, you want to make sure that your Sled Push movement and technique is as efficient as possible. Maintaining a low body position will allow you to avoid wasting energy. It will ensure that all your effort goes into pushing the sled forward. If your hands and body are positioned much higher than necessary, then you will drive force downwards into the sled and make your movement inefficient. Drive the XPO Trainer using quick, short steps. This footwork will make moving the sled easier when you need to generate power to get it started, and keep the momentum of the machine moving once it is in motion. Stopping and starting only wastes energy. Once you are moving keep it up. Dig deep, set your eyes on the end point and don’t stop until you get there. We all have a dominant leg and arm, but in order to keep that sled moving, both legs and feet need to be powering like pistons to get that workload shifted! Make sure that you don’t push whilst one leg is fully extended, because you won’t generate any significant force with it at that point in time. Both legs need to be constantly working at all times. This links with taking short steps as the two technique tips compliment one another in order to create a powerful forward motion. These workouts are specially designed not to include any highly technical movements and will test you physically, mentally and emotionally. The idea is that you must only focus on the job at hand. With “D-Ball Smash” and “Burpee Hell” there is barely any variation to break up the monotony. They become Sisyphean tasks where you will have to find you own way to mentally cope with the tough challenge ahead. Try breaking the reps down into smaller segments, as this will help to make them less daunting. TIP: Remember to stay hydrated, especially on the longer WODs. The combination of intense bursts of activity and slower exercises such as walking lunges will keep you operating at a high heart rate and your metabolism burning fat for hours even after the workouts are over. For time. Remember to stay focused and maintain good form on the Sled Pushes. The XPO Trainer can also be used for rehab and lower intensity work. It takes a different kind of toughness to start again from the beginning after an injury, but this is essential for a full and proper recovery. The resistance curve that works so well for max effort style training sessions is also effective at the lower end of the spectrum. Often in recovery work, an athlete will be required to push against static objects in order to test the quality and rate of their progress. The XPO Trainer is a perfect tool to use here because it offers progressively more resistance as an injured athlete begins to improve, recover and get stronger. The appropriate level of effort can be gauged realistically and accurately, depending on the current state of the athlete. Moving straight back to the barbell or rig too quickly often results in repeated injury. The XPO Trainer is also safe to use on any surface including indoor floors, it is quiet (no more metal screeches on concrete) and is easy to transport and store due to its removable handles. Add it into your next session.